When the Photon is powered via the USB port, VIN will output a voltage of approximately 4.8VDC due to a reverse polarity protection series schottky diode between V+ of USB and VIN. When used as an output, the max load on VIN is 1A. How is it that it outputs 4.8V due to the "reverse polarity protection series Schottky diode"? How does the Schottky diode influence Vin in such a way that it outputs 4.8V? Also what does it mean when it's between "V+ of USB and VIN"? Is it that it's connected across the positive terminal of the USB pin, to VIN? 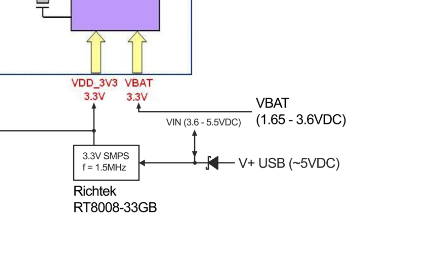 A Schottky diode typically has a forward voltage drop of 0.2 to 0.3 V. So if 5 V is applied at "V+", then only about 4.8 V is available to supply the Richtek switching converter or any other circuits that might be connected to that same circuit node. The reason it's called a "reverse polarity protection" diode is because its function is to protect the circuit in case the USB connector is somehow connected in reverse, applying ground to the "V+" node and +5 V to the ground node of the circuit. In that case the diode will be reverse biased and not allow current to flow through the circuit. Not the answer you're looking for? Browse other questions tagged diodes schottky reverse-polarity reverse or ask your own question. Is a Schottky diode appropriate for reverse polarity protection? How to detect reverse-polarity post-mortem?